Welcome to The Scoop! This is the realeset Yu-Gi-Oh! News Report that you'll find, and of course it's right here on ARG! It may not always be the longest because news happens fast, but I promise I'll be bringing you all the Yugi-News and happenings in the community as they occur so keep an eye out for the latest and the realest scoop on everything that you want to know! Brake gets Savage'd by Social Security Recipient! At the conclusion of Round 1, Billy Brake had been completely and utterly dismantled by a senior citizen by the name of Mike Sayre. The most APE deck of the format, Qliphorts, managed to 2-0 Billy, who was piloting Nekroz, with an onslaught of attacks and a game 2 Naturia Beast/Mind Drain combination. What insanity have we come to in this game? "Sayre Pendulum Summoned the Carrier back to the field. He used Scout to search out Qliphort Shell. Next, he used Tenacity of the Monarchs to add The Monarchs Stormforth to his hand! 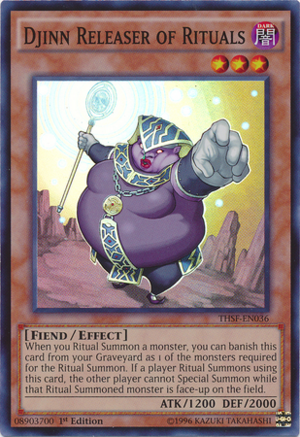 He used it to Tribute Trishula, along with his own Helix, for Qliphort Shell! Helix’s effect destroyed Book of Eclipse, but Brake saved himself with his last Nekroz of Valkyrus! When Brake drew his next card, he knew he had no monsters and no way to defend against Sayre’s Qliphort army!" Now everyone makes mistakes, and I hold no mistake too great for any player at any given time. But I, personally, would have expected Billy to realize that Sayre was unable to activate The Monarchs Stormforth after Special Summoning a monster(Qliphort Carrier) from his extra deck earlier that turn. Did he catch the jitters? Did Sayre's savagery bring back memories of Frazier Smith in the Dragon Ruler formats? Who knows... All we know is that is certainly one of the most entertaining feature matches we've ever had the pleasure of experiencing. 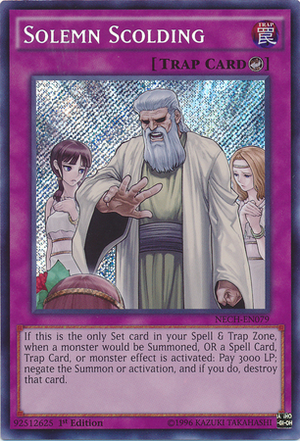 The being that appears on the artwork of most "Solemn" cards, jumps back into the competitive scene in the form of Solemn Scolding. A card that had effectively seen little to no play until this past weekend. Some duelists concluded that Djinn-locking your opponent and following it up with Solemn Scolding was just too good of an opportunity to pass up. It worked in some regard or another as we saw a few copies work its way into the top decks. A card that was only $5 a week ago had potential for what may only be one event, so it is uncertain if it's going to see much more increase in price. If you keep up with YCS's and their final matches, then you'll know that the final match of this YCS featured the same two participants that competed for the title of YCS Tacoma Champion. Those two duelists are Barrett Keys and Stephen De Lara. I must admit that these two are performing exceptionally. Neither became back to back champions out of the ordeal. But they both got a Championship out of them and they appeared in two consecutive finals, a feat which only a handful of players in the games history have accomplished. So congratulations to both of them on the appearances, and congratulations to Stephen De Lara, YCS Chicago Champion. People are still being Djinn-erates? Yes, even after the controversial move to perform a Djinn swap by none other than ARG's own Patrick Hoban, people were still offering to side out Djinn in Nekroz mirror matches! And their opponents were accepting? Now, of course, things are a bit different. Everyone wanted proof that the opponent was not siding another Djinn before moving forward with the agreement. People went so far as to show their side deck cards, to asking to only side deck one card. I even had someone sitting next to me show me his side deck to verify that he did not have another Djinn sided. There are certainly two sides to that whole argument, and I believe both of them can be left in the side deck. I do, however, have a very interesting question to pose to you... Is Patrick Hoban contributing to the intelligence quotient of the lower-medium spectrum of the Yu-Gi-Oh! community? Is he making them see things that they wouldn't have regarded as an issue before hand? Did his move "wisen up" the masses of players who initially may not have been sharp enough to catch such a finagling of side deck antics and in-game trust? What do you think? Add that to the comments below! That's it for The Scoop guys, stay tuned as we cover some of the most pressing topics in the game in the coming weeks including the new set releases, the stability of the game in it's current state, and answering questions like "Could the top 16 draft format be constructed better?" Until next time, Play Hard or Go Home! Why Play Shaddolls for Ycs Chicago? I really want the inside scoop on Patrick’s deck. How many Solemn Scolding did he really play? Can we avoid bringing this up? Every Damn article on this site have comments like this, its just degenerate and stupid to a point, just get over it. His decision is his decision. The writer asked people to comment about this in the comments so why wouldn’t we? Which part wasn’t morally conscious or fair? So lying to you opponent about both players agreeing to do something before a match and then not doing it while you opponent follows through with the agreement is not wrong to you? Wow, no wonder everyone things YuGiOh players are the scum of the TCG world. Bluffing is fine, but straight up lying is not good sportsmanship. Be clear, I’m neither degrading it nor glorifying it; but look at it from what it is. He offered to side out a Djinn – He did. He never said he wouldn’t side one in. He never said the opponent couldn’t side one in, or keep one in if they mained two. There was certainly a misunderstanding of the deal that Patrick was fully aware(because it was his plan) and decided to not correct it. You may argue that lying by omission isnt lying if you want but I’m clear on this. no decklist for the winners? or top 8 like detroit? I’ll work on that next time, thanks! Yeah, because it’s still happening. That was kind of the point of that section.